Tudor Cistercian Ware from South Yorkshire/Midlands. Figures supported a dish containing salt. Dish now lost. Tudor House & Garden, Southampton, Hampshire. The Victoria and Albert Museum and BBC 4 have embarked upon a year-long collaboration exploring the history of British Decorative Arts, Handmade in Britain: a BBC and V & A Partnership. The three-part series Ceramics: A Fragile History has recently aired on BBC 4, each episode focussing upon a different aspect in the history of British pottery: The Story of Clay; The Age of Wedgwood and The Art of the Potter. In addition, BBC 4 have produced a documentary on the Treasures of Chinese Porcelain and another on the East Window at York Minster, in which historian Dr Janina Ramirez unlocks the secrets of this magnificent stained-glass window, the largest of its kind in the UK. This posting will be the first of several, providing my response to this landmark collaborative project. In the last couple of weeks I have plundered my art history books, visited museum collections and gone through thousands of digital and photographic images I have taken over the years, to bring you this series which I hope you will find interesting. The series Ceramics: A Fragile History positions pottery within its socio-economic context, an object infused with social DNA and a snapshot of society preserved in clay. The history of domestic pottery in Britain dates back 5,000 years to Neolithic times, when functionality presided over form. Until the late 16th century red clay was used as the base constituent and in the 1660s the appearance of British domestic pottery began to change following an influx of Dutch and German artisans fleeing religious persecution in their respective homelands. English delftware slowly emerged and by the end of the 18th century the term ‘delftware’ was used to refer to tin-glazed earthenware made in Britain. Tin-glazing enabled potters to decorate their objects with coloured pigments applied over a lead glaze, made opaque by the addition of tin. English delftware should not be confused with Dutch delftware. Tudor stoneware jug from The Rhineland. Tudor House and Garden, Southampton, Hampshire. British pottery certainly came of age in the 1600s. Another European import was stoneware, a favourite with German wine exporters from the Rhineland region. Stoneware was very hard, knock and water resistant. In the 1670s, John Dwight, an Alchemist and Venture Capitalist from London, managed to solve the mystery of how to produce stoneware. In 1672 he opened his factory, Fulham Pottery, which remained in business for 300 years. The factory no longer exists but the bottle kiln still does. Slipware was a course rustic-looking earthenware, popular in rural communities but not great for everyday use as it chipped easily. Thomas Toft is a key figure in the development of slipware. His most prolific period was from the 1660s to the 1680s, he died in 1689. His dishes are characteristically 18-20 inches in diameter with a half inch rim and the centre decorated in earthy tones: dark brown; chocolate and pale brown. Pottery has been used through the ages as a canvas to mark important events in an individual’s journey through life such as births, marriages and deaths or even key historical events – for example a Royal Wedding. In the course of my travels over the years I have purchased many china souvenirs emblazoned with the name of the town visited. Admittedly, I have subsequently sold on many such porcelain trinkets at table-top sales, boot fairs or have donated them to my local charity shops. 1860-1915. Pottery can be used to entertain and amuse. Ceramic Fairings, brought as souvenirs at fairs. Tudor House & Garden, Southampton, Hampshire. In 18th century Britain, a fashion for tea-drinking generated a demand for porcelain from China, specifically the Jingdezhen region. The tea-drinking ceremony and associated paraphernalia, transformed the elegant Georgian drawing-room into a performance space and porcelain tea sets with glittering gilt-edges became the stars of the show. The humble teapot evolved as a potent, matriarchal symbol of hearth and home, positioned at the head of the household. How many times have you heard the phrase, “shall I be mum”, preceding the pouring and assembling of a cup of tea? 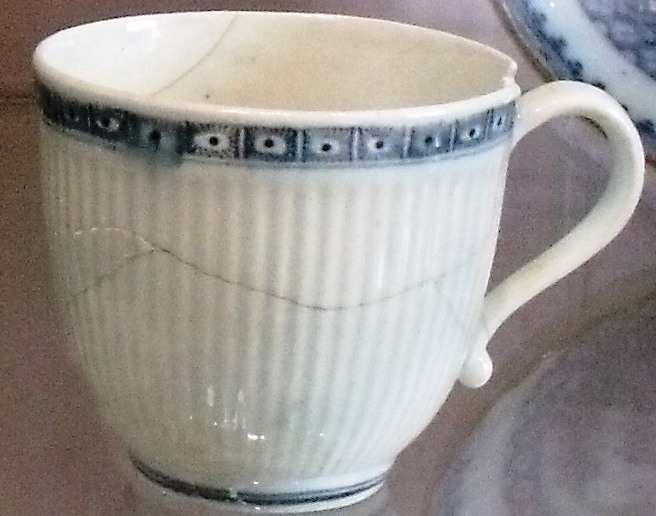 White salt-glazed cup, circa 1720 for drinking chocolate. Tudor House & Garden, Southampton, Hampshire. In 1794 Josiah Spode developed a formula for bone china, a mix of china clay, stone and ground bone. Bone china revolutionised domestic pottery. Transfer printing onto china was also popular at this time enabling wares to be mass-produced and not subjected to the labour intensive process of hand-painting. Transfer decorated plate showing the 'evils of drink', 1800s. Tudor House & Garden, Southampton, Hampshire. In the 19th century, a Victorian obsession with sanitation fashioned an unlikely use for stoneware. Civil Engineer, Sir Joseph Bazalgette created a sewer network for central London, which opened in 1865. Sir Henry Doulton provided the stoneware pipes. The first flushing toilets were created by George Jennings and visitors to the 1851 Great Exhibition paid a penny for the privilege of using them. Ceramic sanitary ware became elevated to works of art and objects of beauty but all the while retaining functionality. Elaborate WCs with painted designs, transfers or hand enamelling were all the rage. Tommy Twyford & Doultons were pioneers in this field. Underneath the Wesley Chapel, City Road, London you can still see today early examples of a Thomas Crapper toilet with the cubicles and sanitaryware fully intact. The toilets were built in 1891 and are a most attractive example of ceramic sanitary ware from this period. Many Victorian homes, shops and restaurants incorporated ceramic tiles in their exterior and interior designs. In 1870 the Refreshment Room at the V & A was decorated floor-to-ceiling with Doulton tiles. In 1902 Arts and Crafts ceramic sculptor and artist William James Neatby (1860-1910) designed the Doulton & Co tiles for Harrods Food Hall. 1890, Doulton's white Carraraware tiles designed for the facade of Oakley & Watling Provisions and Fruit Merchants, 56 High Street, Southampton. Image is of a Southampton Hulk. To find out more about Handmade in Britain: a BBC and V & A Partnership. Click here.